Caption: Above is a group photo with key members of the research team (at a Vietnamese restaurant in Diamond Bar). 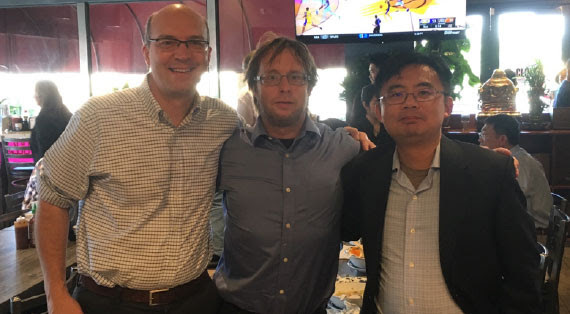 From left to right: Mark Chandler (Earthwatch Institute), Darrel Jenerette (University of California Riverside), and Jun Wang (University of Iowa). Teasing the Signal from the Noise! Through the help of nearly 1,000 community member participants in Operation Healthy Air, we have collected hundreds of thousands of data points in various formats. After picking up the last field sensors in early October, we are now making sense of all this information. We are trying to discern the patterns and test ideas about trends in air quality and temperature over the region. We—as a project team—owe this next step of analysis to our funders, NASA, but also our institutions, partners, and community scientists. While we are anxious to produce the definitive figures and results that increase our knowledge about air quality that can lead to action, there remain a few steps required to get there, and this is what we have been doing. In technical terms, we often call this data cleaning and curation; this often includes rolling up our sleeves and scrubbing. Using the Wikipedia definitions, data cleansing, data cleaning, or data scrubbing is the process of detecting and correcting (or removing) corrupt or inaccurate records from a record set, table, or database. Like museum curation, we need to “curate” data to ensure its value and use for analysis both today and to ensure it remains available for reuse—shared and into the future. All of this data is the result of the help and participation of more than 20 local partner organizations, 150 community members, and ten schools—including 700 of their students! To view a map of where of this data was collected, visit the Operation Healthy Air Participants webpage. One of the questions that the data will start to help us understand better is the extent to which local trees can help cool and/or alter the air quality around homes and schoolyards. To gather local-level information, many participants helped us map using the online tool, Habitat Network, which maps the kinds of habitats around the sensors. Many participants also collected information (using a tape measure) about the local tree under which the sensor was placed. While we have not completed pulling this information from all sensors together, here is an example from one home of what bringing this information together in one location looks like. A “Habitat Map,” created for a home in Riverside, is available below. The various shapes represent different kinds of habitats mapped and identified: darker grey is asphalt or concrete pavement, lighter grey is buildings, brown is soil, green is grass, etc. The round “bull’s-eye” objects are mapped trees. 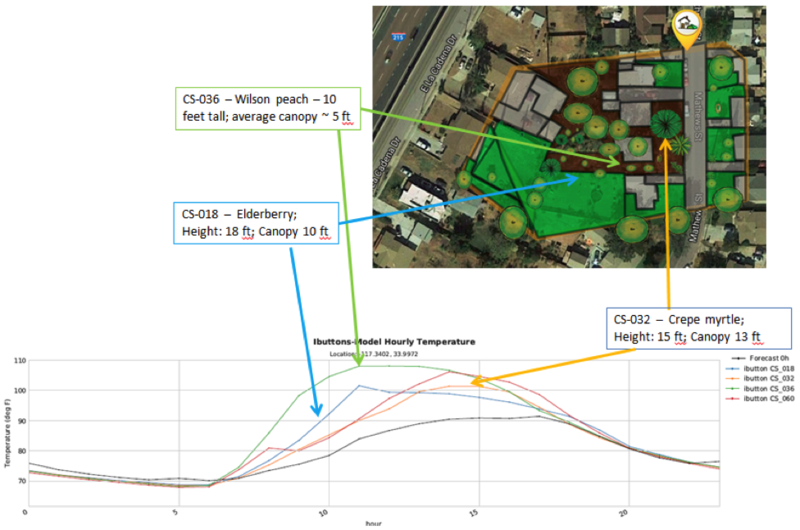 Three iButton temperature sensors were placed around this home (three different colored arrows) and thanks to the help of the local community scientist, we have species identification and size of each tree where the sensors were placed. For example, sensor number CS-032 was placed in a crepe myrtle that was 15 feet tall and had an average canopy width of 13 feet (see the yellow lines). We also plotted the average daily temperature (24 hours—zero is midnight) for each of these sensors. The black line along the bottom is the predicted temperature using a weather forecasting program, and the red line represents a separate sensor not mapped. From this plot, we can see how different the temperature profiles are from one tree to the next. The green line for the Wilson peach is for the smallest tree heats up earlier and much hotter than the other two trees, and the elderberry (blue line) heats up earlier than the crepe myrtle. We are planning to use the Habitat Maps to compare different homes and whether the amount of pavement predicts local temperature differences as well. While there is much more to do, we wanted to share these early results to illustrate how we are beginning to use the data so many local participants helped us collect. Thank you! As always, please send any suggestions or ideas to me at mchandler@earthwatch.org.